Two vertical stability coils (orange) provide fast vertical stabilization of the plasma. An array of 27 ELM coils (green and blue) provide a magnetic ''massage'' of the plasma exterior to suppress potentially harmful power deposition on plasma-facing components. 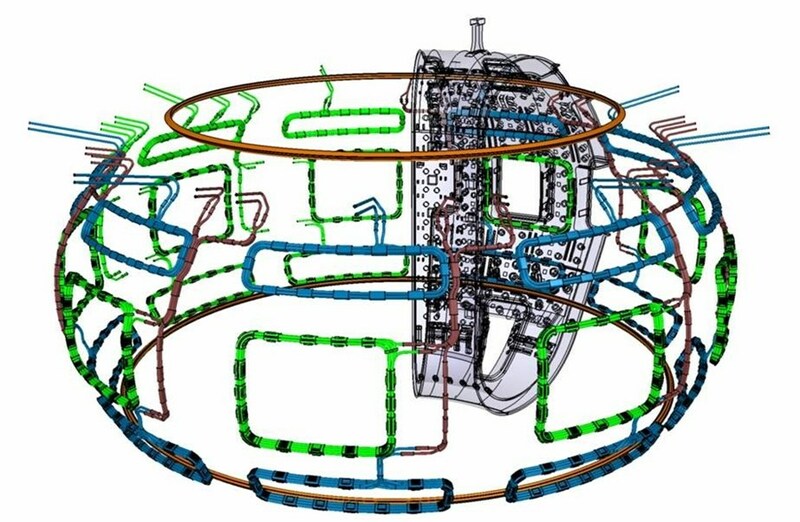 Last week, experts from around the world assembled virtually in Cadarache to conduct a preliminary design review of the ITER in-vessel coils and feeders. Their mission was to evaluate the results from the preliminary design work presented by the in-vessel coil design team. 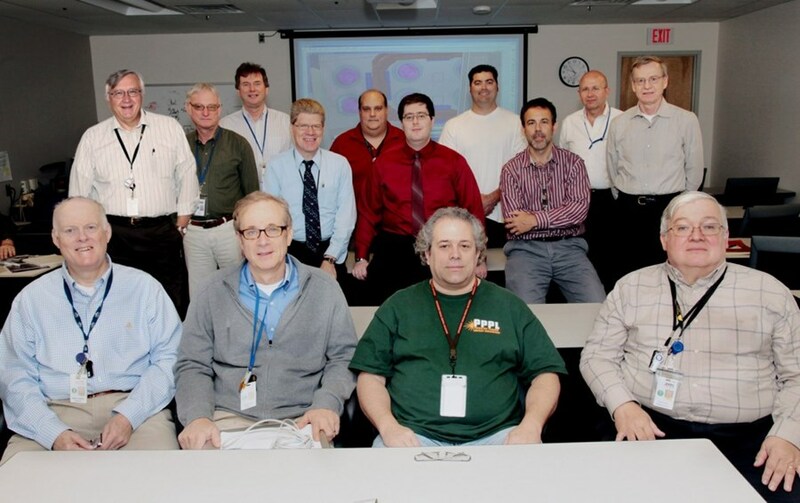 The hard work of the design team lead by the Princeton Plasma Physics Lab (PPPL) paid off with a successful review enabling design and R&D activities to proceed towards an interim review planned for March 2011. The ITER in-vessel coil system is comprised of two systems: the vertical stability coils and the edge localized mode (ELM) coils. 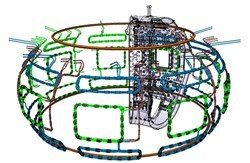 The vertical stability coils are two poloidal field coils located above and below the tokamak's mid-plane. They provide fast vertical stabilization of the plasma. The ELM coils, an array of 27 coils fixed to the wall of the vacuum vessel, provide resonant magnetic perturbations in order to control the plasma so that certain types of plasma instabilities called edge-localized modes are avoided. Each in-vessel coil is wound from about 50 metres of conductor consisting of a 59-mm outer diameter stainless steel jacket, an insulating layer of magnesium oxide and an inner copper conductor. Magnesium oxide is chosen for its ability to withstand the harsh radiation environment within the Tokamak. In total, the in-vessel coils require more than 4 km of mineral-insulated conductors. The control functions provided by these two coil systems are part of the overall plasma control system that ensures and maintains stable plasma operations. Two vertical stability coils (marked orange) provide fast vertical stabilization of the plasma. An array of 27 ELM coils (green & blue) provide a magnetic "massage" of the plasma exterior to suppress potentially harmful power deposition on plasma-facing components. 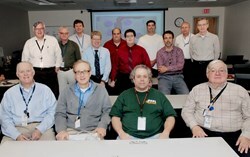 The masterminds behind the in-vessel coils at the Princeton Plasma Physics Lab. Each in-vessel coil is wound from about 50 metres of conductor consisting of a 59-mm outer diameter stainless steel jacket, an insulating layer of magnesium oxide and an inner copper conductor. Magnesium oxide is chosen for its ability to withstand the harsh radiation environment within the ITER Tokamak. Water will flow through the central hole to remove power deposited from resistive and neutron heating. In total, the in-vessel coils require more than four kilometres of mineral-insulated conductors. Click here to learn more about ELMs and how to control them. Clikc here to find out why not all ELMs are trees.